Former EOH CEO Asher Bohbot. EOH [JSE:EOH] has appointed non-executive director Jesmane Boggenpoel as interim board chairperson as the search for a permanent chairperson continues. The IT service company made the announcement in a notice to shareholders issued on Friday evening, shortly after markets closed. EOH shares, which opened at R14.36 per share on Friday morning, ended the day at R14.06. 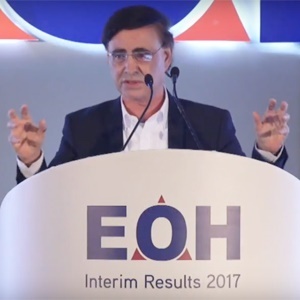 EOH's former chairperson and founder Asher Bohbot resigned in February this year. The group said Bohbot would continue to serve in an advisory capacity until July. Several other board members had also resigned. At the time the announcement was made, EOH shares had fallen as much as 14%, this after Microsoft announced it would terminate contracts with one of EOH's subsidiaries. A nominations committee has started the process of interviewing candidates to fill vacancies on the board, Friday's notice reads. "The board composition, after the required appointments, will be in line with the King IV requirements which make provision for a majority of independent non-executive directors, lead independent director and independent chairperson," the statement read.